Cash reserves held by schools in Wales have dropped by 28% since last year which "should ring alarm bells", a teaching union has warned. A new report showed schools have total reserves of £46m, equivalent to £102 per pupil - down from £64m in 2016. 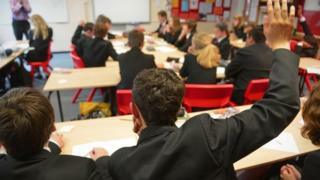 The National Association of Head Teachers Cymru said schools are using reserves to "plug" funding shortfalls. The Welsh Government said it has "challenged" councils to ensure schools are making good use of their funding. Last year, Education Secretary Kirsty Williams said she was "shocked" by how high some schools' financial reserves were. She had told schools who might have been "hanging on to that money for a rainy day" that: "It's raining". The latest report, published by the Welsh Government, showed reserves in primary schools accounted for £40m or 88% of the total. Anglesey had the highest level of reserves per pupil at £223 while Denbighshire had the lowest with a deficit of £70 per pupil - and was the only area with a negative reserve. The report does not specify what the money has been spent on but councils said cash reserves could be used, for example, to invest in additional resources, staff or capital projects. A NAHT Cymru spokesman said schools sometimes build up reserves for "capital developments that simply cannot be supported by local authorities" due to cuts. "The fact that overall surpluses have fallen by almost 30% in a single year should ring alarm bells," the spokesman said. "It suggests that schools are having to use reserves to plug a shortfall in basic school funding. "This is an unsustainable situation and confirms that our call for sufficient, equitable and transparent school funding can no longer be ignored." An Anglesey council spokesman said it was "prudent financial management" for schools to ensure they have "adequate" reserves. "The authority is aware that Anglesey primary schools hold the highest level of reserves per pupil and have been working with schools and governing bodies to ensure that the best use is made of the reserves held," he added. "As the pressure on local government budgets increases, school budgets will invariably fall in real terms and we expect school reserves to reduce over the next two to three years." Denbighshire council said school budgets were monitored closely and part of the process includes a three-year financial plan for each school so that under and over spends can be managed over the period. "The balances are set to stabilise in 2017/18 and the council is planning to further increase school budgets in 2018/19, but pay pressures and further cuts to council budgets in future years will be a threat," a spokesman added. The Welsh Local Government Association said: "Authorities have increased the levels of funding delegated to schools which now exceeds 85% in all but the most rural authorities where transport costs are particularly high. "Authorities are working closely with their school budget and support schools in their financial planning but all statutory services, including schools, will continue to be under immense pressure." A Welsh Government spokesman said: "Whilst the overall level of reserves has decreased, and some schools are making better use of their reserves, there remains a varied picture with some schools still maintaining higher balances of more than 10% of their total delegated expenditure. "We will be working with councils over the coming months to see what further can be done to ensure all schools are making best use of the resources available to them. "The draft budget provides protection for schools. This includes prioritising £170m over two years to enable local government to maintain frontline schools delivery and £40m extra capital to accelerate investment in new schools and colleges." Can schools and care escape cuts?